Ondine is simply one of Edinburgh’s best fish restaurants and if you love shellfish, delicious fish dishes and brilliant service, then this is the place to go. Like most fine dining restaurants, they also know how to look after the gluten free diner – hooray. Enjoying a work dinner at Ondine, I just knew from the moment I arrived that they would go out of their way for me in terms of information and little extra touches. And the gluten free choices are excellent. As you might expect, with tons of fresh fish, oysters, smoked salmon and everything cooked or served very beautifully, GF is never going to be a problem. There were a few no-gos, such as brioche, breaded fish and tempura, but there were plenty of other dishes to choose from, including battered fish and chips! The wines are interesting too – lots of flavour and punch to choose from, including a really zingy portuguese wine we had before eating and a dry Albarino with our meal. 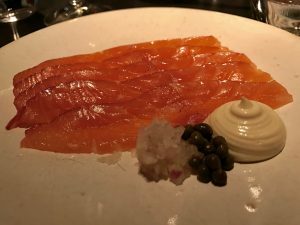 To start I enjoyed some generously and beautifully sliced Scottish smoked salmon with wasabi mayonnaise, capers and shallots. This was literally gleaming on the plate and each slice made a lovely little roll with the mayonnaise and capers in it – gorgeous. For mains, there was a general move towards the fish and chips among the gluten-eaters, but although I could have had it too (wow), the thought of Isle of Mull scallops was too much to resist. Each scallop came with a mini sausage (gluten free!) inside the shell and with some of the GF chips (even better!) and brocolli with chilli, this was a meal with a good mix of flavours and textures. It was actually quite filling too – so I couldn’t finish it. Not being with gluten glutton family this time, no one finished it for me, which was a shame. There is something about scallops that while they are so delicious when cooked well, they are so rich you could not eat them two days, or even two weeks, in a row. But here their richness was somehow taken away by the addition of meaty little sausages – it’s an interesting combo. 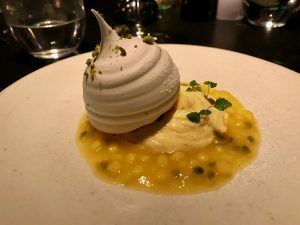 I am not usually a huge pudding eater, but I was trying out the full menu, so went for a passionfruit pavlova that was tart and very pretty. It also bore a striking resemblance to little Zingy from the EDF adverts! Rounding off the meal superbly were some little petits four, including tiny bites of macaroon with orange zest, made specially for me. I was even brought extra ones as a treat, which was a very nice touch from the fantastic servers. 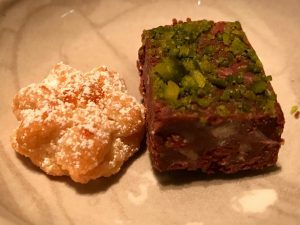 The service at Ondine is excellent and as with any restaurant of this calibre, they are going to look after you really well. However, Ondine has a particularly friendly and cheerful vibe and would be a good location for a relaxed celebration as well as our working dinner. The ceiling is a little low and the lighting challenged my photography skills, but I could not fault the food, the service or the overall experience.